If you ever indulge yourself in the Home and Garden TV fantasy experience of an entire remodel in less than an hour you realize, in more rational moments, life isn’t like that. Living through a major garden redesign is one of those events that remind you what reality really looks and feels like. 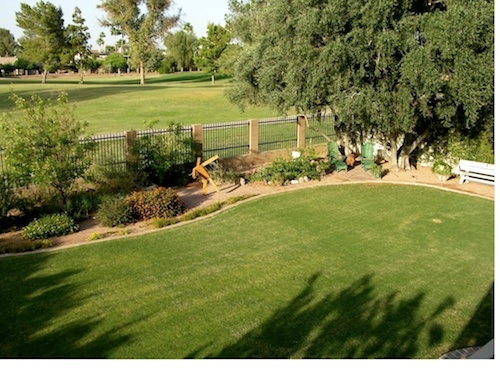 Once we decided to redesign the garden we called Jeff Nielson of Desert Green Creations in Tempe. We had worked with Jeff previously and presented him with a photo album of the pieces we wanted to feature. Jeff came back with a great plan. We made some square corners into round and added a bit here and there and we were immediately excited about our decision. He had suggested a plant plan as well but here I hesitated. I wanted to carefully select the plants, I wanted to attract and support more butterflies and hummingbirds. There are plants I love to see in someone else’s garden but don’t necessarily want them to live in mine. 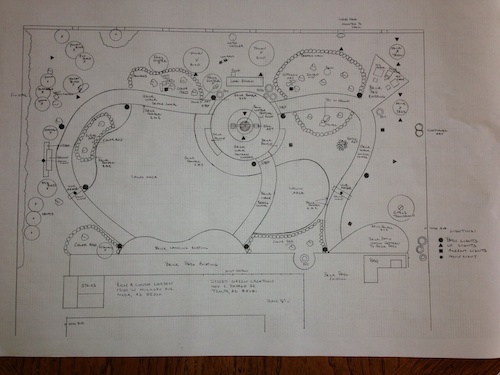 So the plant choices would come later, but the design was approved and we got in line for his schedule. 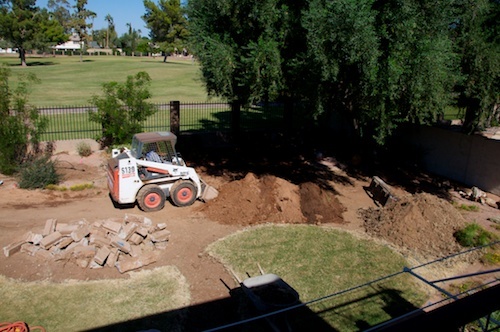 Deconstruction began in mid-September with killing a large portion of the lawn. We then removed all the Rich-made elements, and the plants we wanted to keep. This was no small task. We relocated a large toad which was discovered deep in the soil of one flower bed. 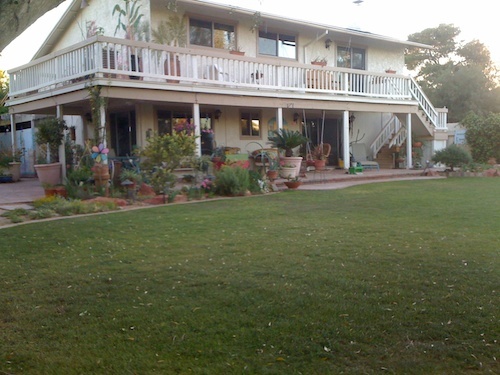 We have gardened here on the plot of ground since 1977. 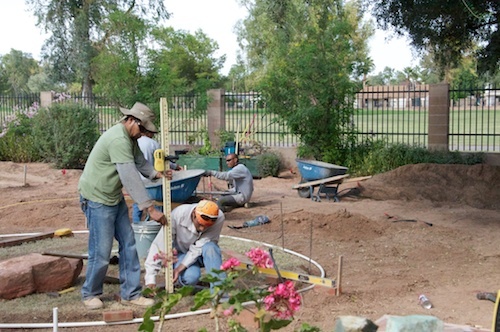 We began with bare dirt and have worked continually to make the garden wonderful. Now we had to let it be torn apart with a Bobcat tractor, which drove in and stayed in operation for two weeks. Then a concrete mixer whirred on the street for nearly 10 days to set the brick edging framework. There was serious measuring, engineering, leveling and digging. Digging is truly an art. It is intensely hard labor, demanding strong muscles and back. Yet strong isn’t the only requirement, skill in the use of the tools and the awareness of the type of soil is critical. There are pointed shovels, rounded shovels, picks, trowels and hands. There is an electric jackhammer with a shovel to pierce the hard soil. Knowledge of how to use the tools is essential to create the intended space. Trenches must be level in a uniform depth, aligned to adjoin others, following the plan for water lines, and electrical for lighting. A slight slope of the paths for proper drainage requires a laser level. For nearly three weeks it looked as if nothing was happening, because all the work was underground. I was so anxious to see progress I kept staring out the window. Finally in order to accomplish something I began setting an hourly timer and when it went off I allowed myself a look for signs of progress. Definite Progress, somehow this all was connected correctly! I was so eager for progress I started going to bed earlier. Like an eager child on Christmas Eve thinking Santa would be here sooner I willed morning to come so the crew would return and begin the days’ work. The guys worked so hard. 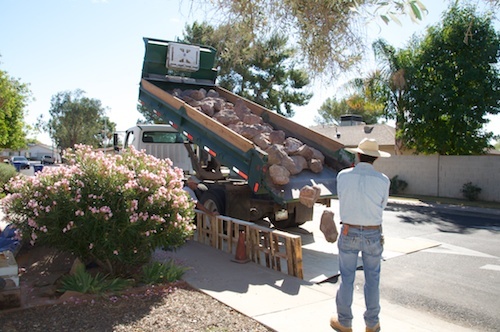 One day a large truck dumped 5 tons of boulders onto the street at 11 am and by 4 pm the crew had moved them all into the garden. My contribution was to plan for the plants. 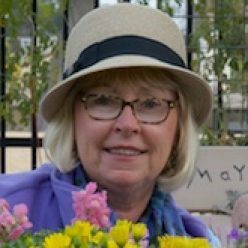 I researched in books and online looking for plants that would survive a brief attack of freezing temperature and a long, intense, dry season of temperatures above 100 degrees. My wants didn’t end there, I also wanted colorful flowers full of nectar for butterflies and hummingbirds with no sharp poky points. A Master Gardener design charrette was held to help with plant choices; I attended a lecture on native plant choices, visited nurseries, and looked at the collection of photos from gardens we visited. Falling asleep at night the last thing I thought of were the plants. 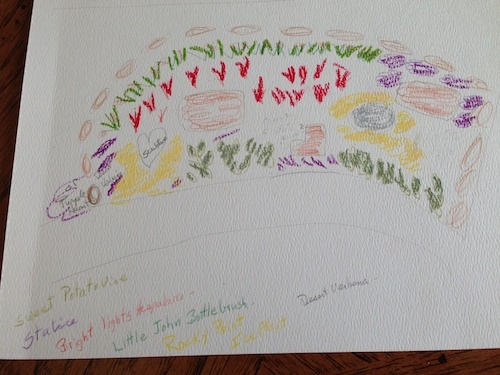 I awoke one night at 2 am and realized I needed to be working with a color wheel in choosing the plants. I knew I had one somewhere so I was up and going to find it. I worked the next two hours considering the plant colors. Every morning the first thing I thought about was the plants. I made lists, drawings and then revised the lists. I read Gertrude Stein’s garden plans, I looked for ideas everywhere. Jeff & I went to the nursery together and talked recommendations from his “go-to” advisor, Steve. I made more lists. 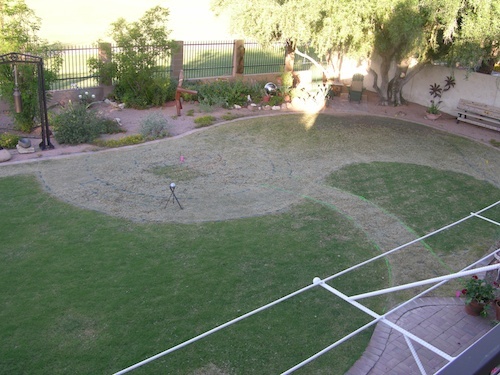 The shapes of the beds finally began to take form, I took photos and made more drawings. Finally the list of plants was made and then delivered! The plants were arranged in the proposed locations. That night I sat outside till it was dark and stared at the plan. I was up before dawn and staring at the garden as the light came up. Meanwhile Rich was making more stuff! 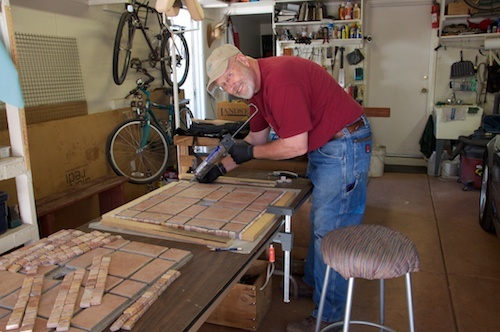 He made four rolling patio umbrella stands with tiled tops. 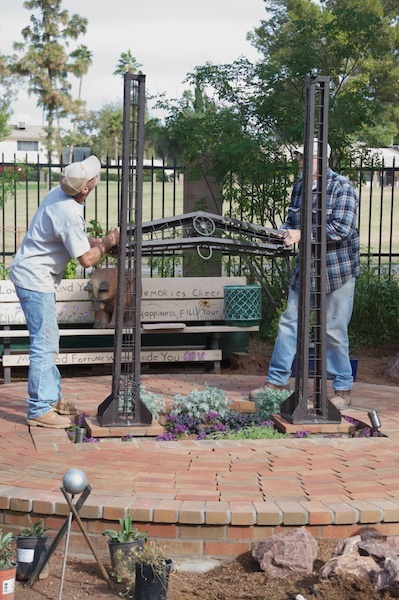 He made two arbors in the same style as the bell frame. He made a privacy screen to separate his workshop area from the garden, he made a piece of flag stone into a butterfly, he took a scattering of old rusty bits of steel we had scavenged from my Dad’s garage and made a new hose bib in the shape of a flower. 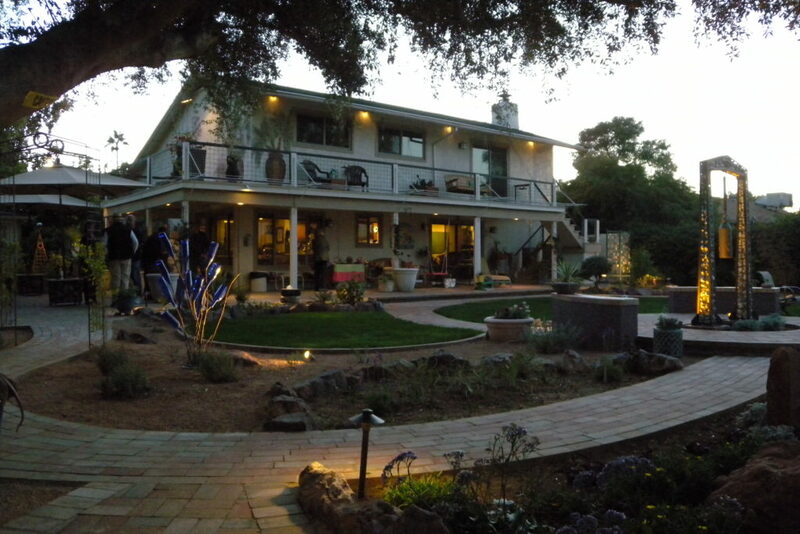 We developed a case of Creeping Project Syndrome proposing changes on the side patio and in the front garden. We proposed rearranging plants from one spot to another, modifying a flower bed shape, and moving the flower pots into different groupings. After staring at the plants for two days the planting began. In one day four beds were planted. One bed is a dream garden of spring flowers. I have yellow iris brought from outside my Mother’s back door to my garden. Purple iris, daffodils (the flower I first remember from my childhood) grape hyacinths, freesias, and lady tulips. These are all on a water line which will flow during the growing season and then in their dormancy I have a gate valve to turn off the water. 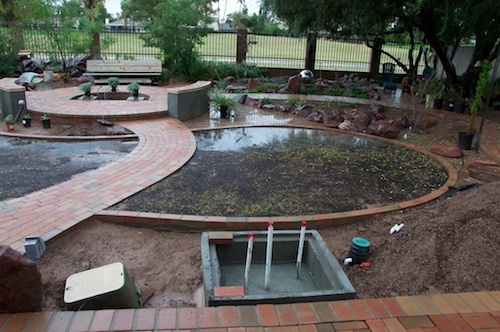 A strong, slow and wet storm dumped 4 inches of water on the just planted beds and made puddles in the unfinished areas. The rye grass seed floated in the water. Still I kept staring out the window wanting the plants to grow. Once the sun returned, work resumed. The rain had rinsed the dust from the boulders revealing the colors of purple, cream and red. The rocks were moved into place shaping the flower beds. The pots were set into place. A totem pole cactus was positioned perfectly on a small rise behind a large boulder. Everything moved forward. 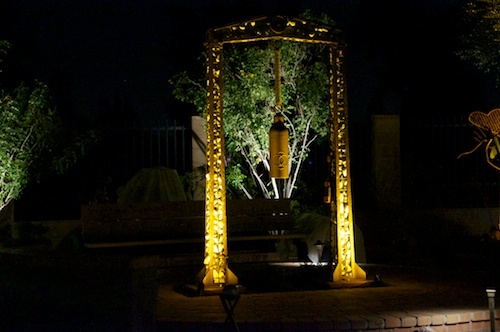 LED lighting was installed and directed to highlight the features of the garden. 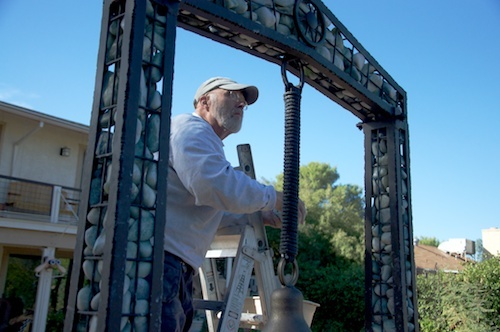 Finally the celebration bell, the piece which inspired this entire transition, was moved into place. Then 350 lbs. of polished green jade beach pebbles were slipped into the wire frame, one piece at a time. 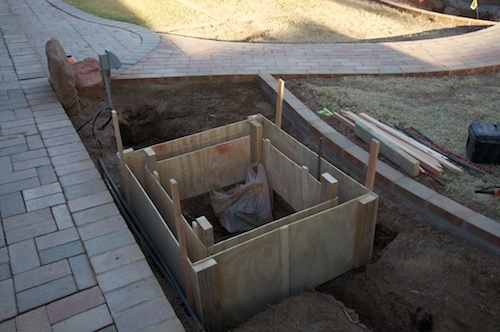 The fountain began to take form, a concrete cistern was formed under ground. The limestone slabs were drilled and chipped into shape. 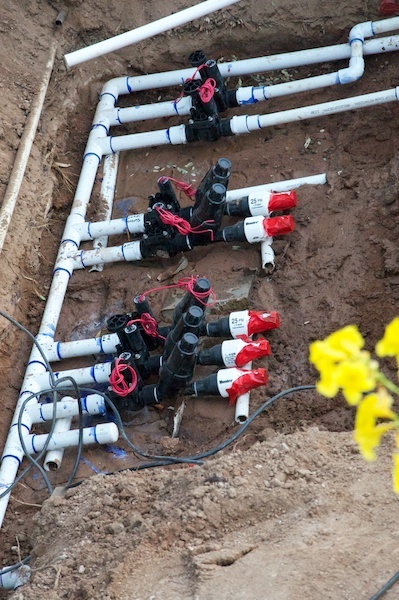 The pump and plumbing were set up to create the water flow. The green stones were laid around the edges to allow the water to fall through the steel grate into the cistern. 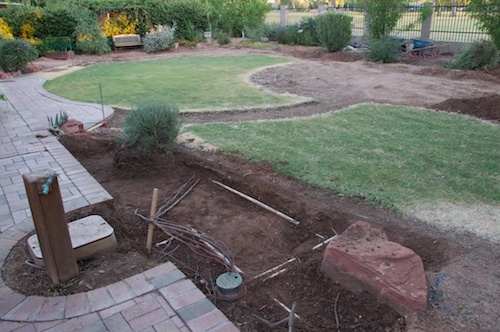 Leveling and grading are essential work that must be done for the garden to function in a practical way. Starting at the uppermost corner of the ground, the crew worked to level the soil. The process in wet, cold, clay soil is very hard work. There are days when incredibly important work is done yet the visual change is very small. 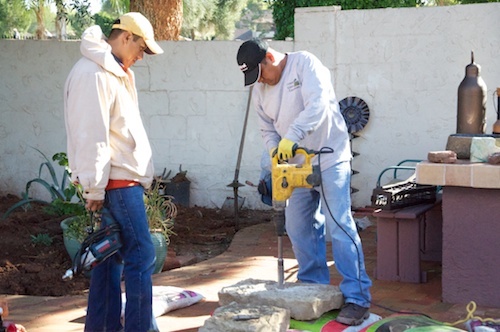 Any building, remodeling project requires patience. It is so hard to be patient. The next day a dump truck arrived with 12 ton of crushed granite. It was not the correct size of stone for the top dressing. So, a delay while the correct material could be found. We were again trying to beat a predicted rain storm heading into town the next day. Loads of rock filled the blue construction wheelbarrows over and over as the material was moved from the street into place. Raking and leveling the granite followed. The large elements complete, we moved into final design adjustments which is both thrilling and torturous! A turn this way, switch out a color there, add, edit, choosing one thing over another are tasks to be done. It is a privilege, it is a finalizing decision, it is only a garden but it is now our garden. Celebration of happiness & joy! We have definitely changed the view.